Of course sunny days are wonderful but when the temperature soars into the high 30s people everywhere begin to feel short tempered, fractious. Even in the green, leafy Minho temperatures can become hardly bearable and people long for the cool of the evening. That's the time to see your friends, meet for a drink, go for a walk.... That's when you need a pretty place to stroll in. 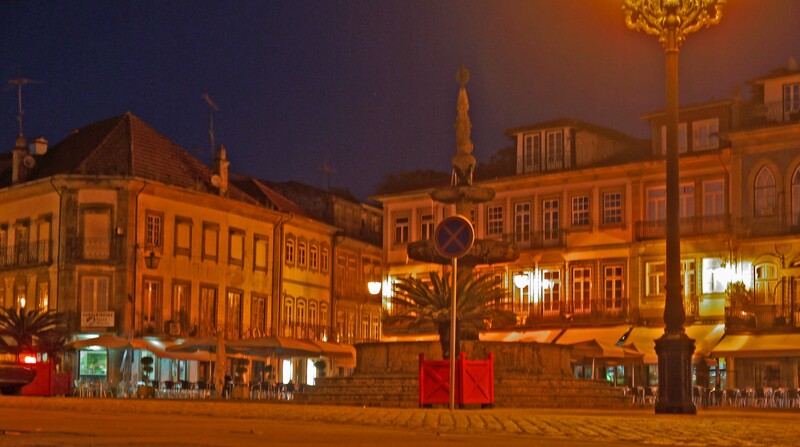 Delight with me in Ponte de Lima at night. When it's hot, there's a lot to be said for a breeze off the water. Imagine with me a stroll over the mediaeval bridge after dinner in the evening. This bridge is said to be on the site of Decimus Junius Brutus' terrific feat of memory, calling across his frightened legionaries one by one using for each his own name. 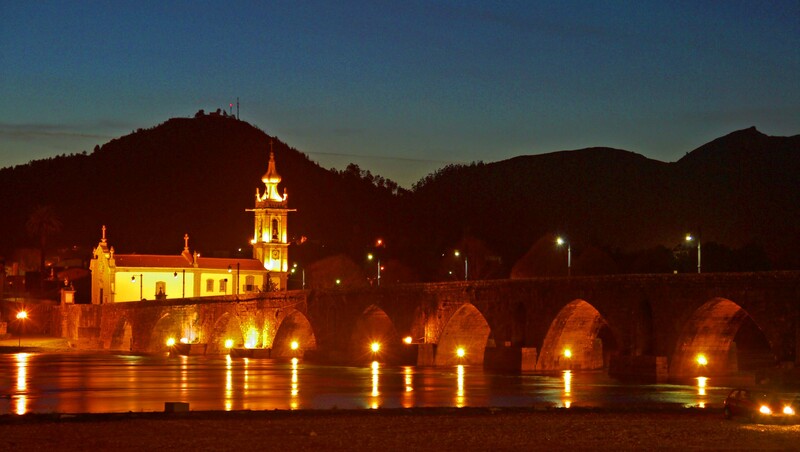 (See Why Settle in Ponte de Lima on the 'Home' page for the story.) Five of the original Roman arches, dating from the first century AD, remain but the rest is fourteenth century, begun in 1368. If you come with me, this is what you will see looking back. Another day we could wander together along the river front, which has recently been radically improved by the town council. Twenty years ago, by day, you would see a wasteland of dust and scrubby grass with, at the water's, edge women beating their washing on stones. The EU has changed all that. People are better off now and have washing machines so today the river is more for leisure and recreation than labour. 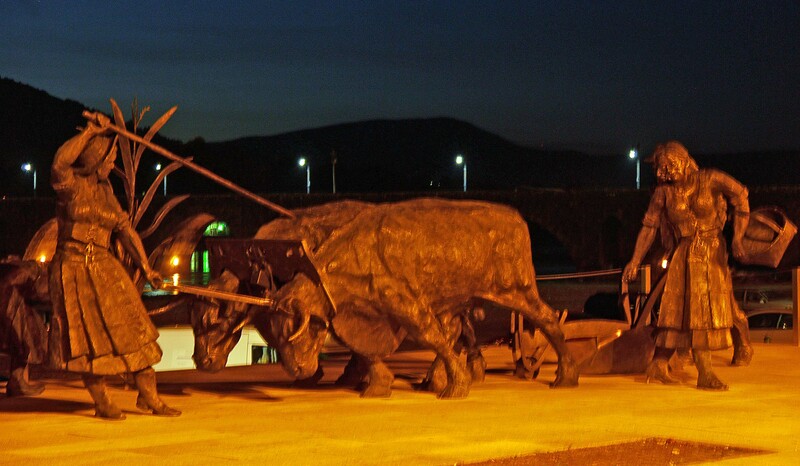 To celebrate the change but recall the past, along the landscaped edge to the river there are bronze installations of traditional northern life such as these farmers with their Minhoto cattle. Note the typical carved wooden yoke. 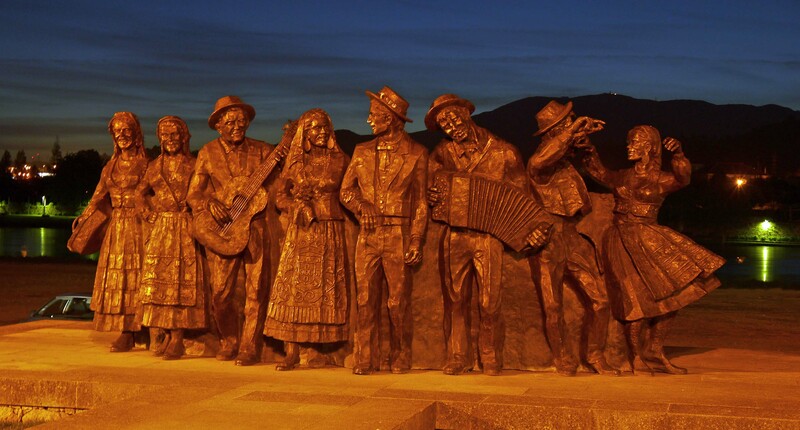 There is a folklore group too, the musicians and dancers elegant and proud in their Minhoto dress, the women with long skirts and embroidered aprons, the men with accordions and a Spanish guitar. Then, having taken the air, why not finish the evening where friends exchange gossip and crack jokes? In a café in the Praça de Camões.